When Jason and Katie met at his family's business (Martin's Downtown), Jason immediately asked the performer about his friend Katie. When she returned on a different night, he struck up a conversation and they've been talking ever since! On a trip to Hawaii to visit her family, Jason took her out for a romantic dinner and walk on the beach and proposed. Katie's favorite part of the day was their "first look" where she and Jason had a special moment together before the wedding (Katie confesses to being a "notorious crier" and didn't want to bawl her eyes out during the ceremony!). Their unique wedding brought together all their loved ones for a Monday wedding at the beach, where they enjoyed the rest of their week in the Outer Banks. 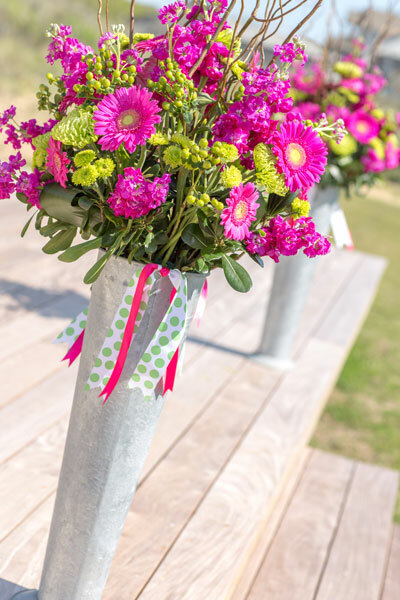 A hot pink and lime green color scheme made it even more fun, with bright pops of color everywhere. Katie also added that one of their favorite aspects of the wedding was their water entrance, where the wedding party boarded a pontoon boat and arrived to the reception in style! Be sure to see the Martin wedding on page 42 of the second issue of bridebook, on newsstands now!